The collection of our Aroma Therapy Incense Stick includes Rosemary Fragrance that is deeply admired by one and all. Its soothing fragrance stimulates both mind, body, and soul that heightens the spiritual experience during fragrance. Made from selected flowers, combustible materials, and special herbs, our range of Rosemary releases a smoky fragrance that captivates all the senses. Also, it is eco-friendly thus you can enjoy the every breath of it. Our Incense Stick is available in long sizes that assure a long lasting lingering effect of its aroma. 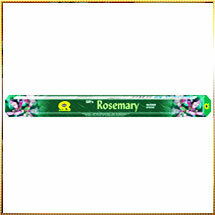 Moreover, we offer Rosemary Incense Stick in air-tight packaging to lock its aroma.